Photos from John Waldron, no reproduction without permission. 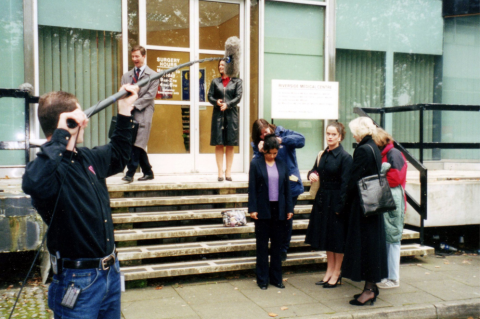 The photos show shoots for the continuing drama, ‘Doctors’, taking place at the rear, and front entrances to Pebble Mill. 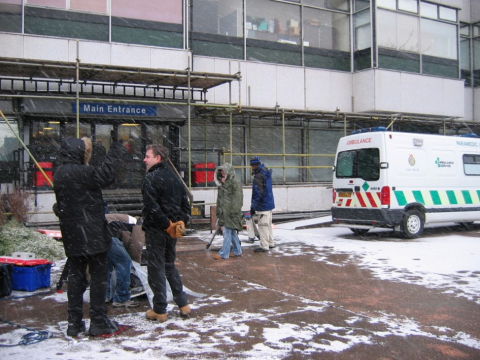 The Pebble Mill building proved ideal in providing multiple locations for ‘Doctors’. With a little dressing the corridors and exterior could be made to look like a hospital or police station. The photos include: Kenny Ralston (swinging the boom in the second photo), Tabitha Wady, Natalie J. Robb, Tom Butcher, and Corrine Wickes. My one memory of this series was going into the restaurant for lunch while the actors all queued up still with their “burn” make up during an episode when people had been involved in a fire, it was so realistic that I could not stand in the queue. Life at Pebble Mill was anything but dull.